SIPs done and planted! Let the season begin! We did it! We made 2 of our older planters “sub-irrigated,” creating reservoirs with various plastic materials (Ansley bought perforated, flexible drain piping, and cut it in half for the first one — which we decided was too hard and too expensive, so we reused plastic soda bottles and some of our stronger old seedling pots to create the space for water in the second). We filled them up through successful fill tubes, until they drained through our successful overflow tubes. Double success! Even better, we got our cool season crops in: snap peas in lines in the two new sub-irrigated beds (lines along the places where we will soon be re-installing our trellises), and lettuces (a green leaf, a red leaf and arugula) and carrots (for the eastern swallowtail butterflies) in the cold frame bed (lettuces closer to the slides, carrots closer to the play area entrance). Thanks Lucy, Maesie, and Eli! We’ll be eating lettuce and snap peas in June, if all goes well, and will have plenty of carrot greens habitat for our eastern swallow butterflies to lay eggs on, and baby caterpillars to eat! The wonderful thing about the carrots is that the caterpillars don’t start to eat the greens until the carrots are almost ready to harvest — so we get carrots, butterflies get the greens, and we have less to compost! Back to our new SIPs: now we’ll see whether the potting soil we purchased from Dahill Landscaping (they gave us a good deal, and threw in a free bale of peat moss — thanks!) 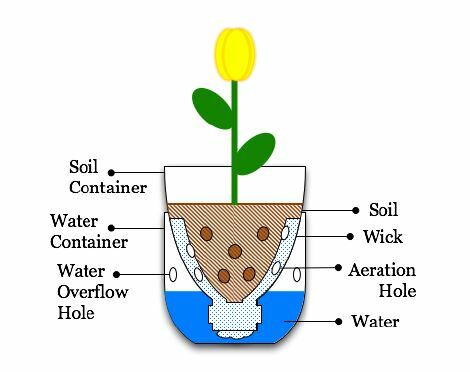 works to “wick” the water up from the reservoirs (the space created by the plastic pipe, bottles, or plant pots between plastic lining on the bottom and landscape fabric on the top) to our plants’ roots. The system works very well in the soda bottle SIPs we made for our seedlings, but there we used a piece of old towel through the bottle neck to pull water from the reservoir to the soil. We’ll see if the light soil mixture we created using mostly potting mix and peat moss works, too! We’ll be figuring out how best to water our new SIPs as we go along. At first — like now — when seeds are planted, we probably need to water from the top, to make sure the seeds germinate. I’m thinking that after the seedlings are established and have reasonably strong root systems, we should try to refill the SIPs through their fill tubes, so that plants grow the strong roots and get water from the bottom. If we keep watering from the top, the system won’t work. We’ll just have to see how often we need to refill the reservoirs — an experiment! The watering schedule (link in the column on the righthand side of the blog) has been updated with new dates for this season and new instructions for the SIPs (after the seeds have germinated and seedlings are established!) — feel free to check it out and think about when you’ll be around to water this season. More work will being done in the coming weeks — Shari and Denise at different times spent much time making a new raised bed (the green plastic one! ), which will be filled with soil, and I think we’ll be changing out the soil in our other bed built in 2011, too. Look forward to a big work day in early May when we will try to get lots (!!) of people to bring in a few bags of mulch from Greenwood Cemetery’s free supply to replenish our slide and climbing wall safety surfacing, as well as our garden paths. And, of course, transplant our basil, tomato, flower and eggplant seedlings from our March 8th seed planting event! Welcome to the 2014 garden season! A post will be coming soon about how to become an active member of our garden — CV Earthlab. We need more committed volunteers to keep us invigorated, thoughtful and innovative! Want to learn more? Email us at cvearthlab@gmail.com! FYI, for posterity, the sub-irrigated planters reservoirs were completely empty 2 weeks after we first filled them, and the soil seemed soaked through. I successfully refilled both reservoirs (it took a solid 15 minutes+) until they overflowed. It looked like the wicking was working: soil seemed to have compacted from the weight of the water that had wicked up from below. Very interesting!